NEW YORK, Oct. 19, 2017 /PRNewswire/ -- Legacy Recordings, a division of Sony Music Entertainment, today announced it will release Stranger Things - Music From The Netflix Original Series on Friday, October 27, timed to the launch of Season 2. Pre-sale of the album begins today https://lnk.to/StrangerThingsSdtk. Available for digital streaming or downloading and on CD, the 30 track compilation album includes a range of beloved 1980s hits and classic tracks featured in "Stranger Things" and the highly-anticipated second season, "Stranger Things 2." The album features nineteen songs and eleven audio clips from the show. A 12" vinyl edition of Stranger Things - Music From The Netflix Original Series will be released later this year. 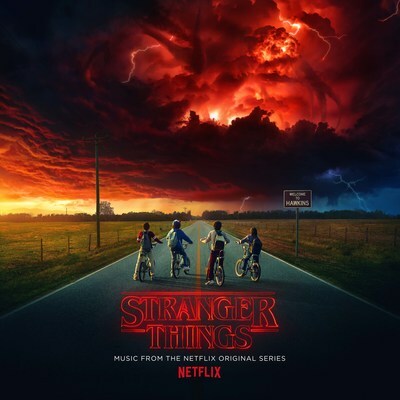 Artists and original hit recordings appearing on Stranger Things - Music From The Netflix Original Series include Toto ("Africa"), the Bangles ("Hazy Shade of Winter"), Corey Hart ("Sunglasses at Night"), and more, along with unannounced titles from Season 2. The multi-award-winning "Stranger Things" was most recently nominated for 18 Emmy Awards, including Music Supervision—the first year ever the category was recognized by the Academy of Television Arts & Sciences. "Stranger Things 2" returns globally to Netflix October 27th. Set in 1984, the citizens of Hawkins, Indiana are still reeling from the horrors of the Demogorgon and the secrets of Hawkins Lab. Will Byers (Noah Schnapp) has been rescued from the Upside Down but a bigger, sinister entity still threatens those who survived. The second installment of the series also features Winona Ryder (Joyce), David Harbour (Chief Hopper), Millie Bobby Brown (Eleven), Natalia Dyer (Nancy), Charlie Heaton (Jonathan), Joe Keery (Steve), Gaten Matarazzo (Dustin), Caleb McLaughlin (Lucas), Finn Wolfhard (Mike), and Season 2 newcomers Sean Astin (Bob Newby), Dacre Montgomery (Billy), Paul Reiser (Dr. Owens), and Sadie Sink (Max), among other stars. Created by Matt and Ross Duffer, "Stranger Things" is a Netflix original series, directed and executive produced by the Duffer brothers and Shawn Levy of 21 Laps. Iain Patterson and 21 Laps' Dan Cohen executive produce. Legacy Recordings, the catalog division of Sony Music Entertainment, is home to the world's foremost library of historically significant commercial recordings, a peerless collection of works by the most significant musical artists of the 19th, 20th and 21st centuries. Across a variety of platforms, the label has revolutionized the catalog market, offering contemporary music fans access to thousands of meticulously restored and remastered archival titles representing virtually every musical genre including popular, rock, jazz, blues, R&B, folk, country, gospel, Broadway musicals, movie soundtracks, rap/hip-hop, world music, classical, comedy and more.